The ME58 is a result of many long hours of drawings, mock ups and testing creating this evolution of one of our most popular yachts, the 57E. This all new design boasts substantial enhancements in performance and volume. 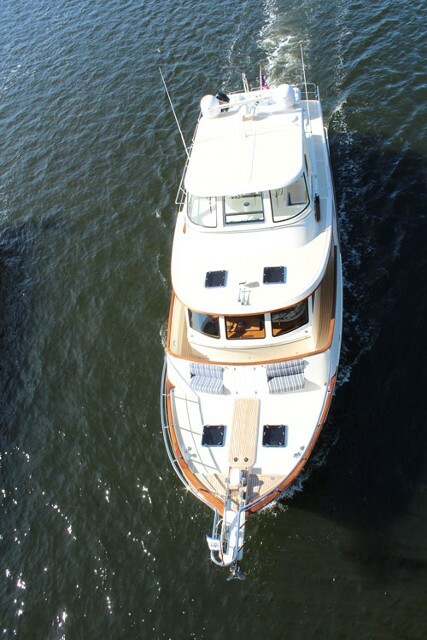 Advanced engineering of this three stateroom yacht allows for a larger port side guest stateroom with private head. The additional crew quarters, larger lazeratte and increased engine room size all add to the comforts of cruising. The lazarette is significantly larger due to our newly designed radiused transom with a center stair access to the aft deck. 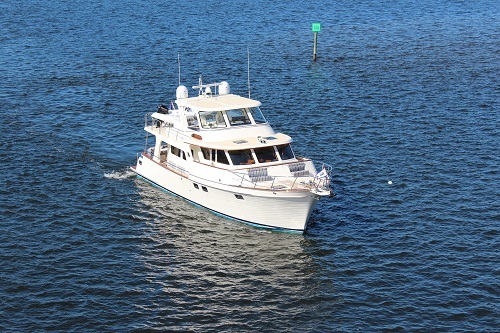 This yacht is fully capable of extended ocean cruising but is easily managed by a couple. The large fiberglass fuel and stainless steel water capacities allow far ranging destinations and the unique and proven hull design guarantees comfort in less than ideal conditions should they arise. The ME58 will astonish you with its internal volume. With a beam of 18'6" it provides the wonderfully spacious stand up engine room Explorers are noted for and commodious interior spaces from the saloon to the staterooms. There are three staterooms below, master, VIP, and port guest stateroom, all with full heads. The u-shaped galley is in the aft part of the raised pilothouse and features every convenience and appliance to make your galley duties a pleasure. The dinette is in the forward area of the pilothouse, with plenty of seating even with the lower helm if in a flybridge model. In Command Bridge models, there is no need for the lower helm so the dinette is especially comfortable and roomy and presents a lovely view through the pilothouse windows. Two steps down from the pilothouse aft is the saloon with built-in seating that doubles as storage with pneumatic lifting hinges, wet bar with storage, TV/Stereo cabinets and lovely teak coffee table. The new ME 58E has additonal fuel capacity resulting in increased range and speed with the same engines as the ME 57. With the enlarged fuel capacity we added another layer of insulation for sound and temperature forward of the perfectly located fuel tanks that do not affect trim whether empty or full. It has duplicates for critical systems on board with backups to insure that your plans can carry on even with malfunction of items such as stabilizer pumps, steering and other key components. The use of increased technology in our Full Stack Infusion® process allows us to reduce weight despite the additional volume and capacities. The water tanks and holding tanks have been installed below the sole amidship for improved balance and greater capacity, providing additional form stability while doing so. The aft deck is an ideal place to gather for morning coffee or evening cocktails. It offers complete protection from the elements with an extended upper deck, while allowing a gorgeous view out to sea or harbor. Whether you prefer intimate seating for two or seating for a crowd, this comfortable and spacious aft deck will accomodate your needs. A single stair to the swim platform below provides easy access for swimming, fishing and dockside activities. The proprietary and protected Strut Keels® are used to great success allowing propeller protection and down sea tracking that has the industries' experts raving. Like feathers on an arrow, these twin tails guide and stabilize the yacht making heavy downwind running a delight rather than a white knuckle experience. Whether you plan to visit the Galapagos, Prince Edward Island, Bermuda or the Spice Islands of the Caribbean the new ME58 will take you there in comfort and safety carried in the hearts and hands of seamen who have been there before you.